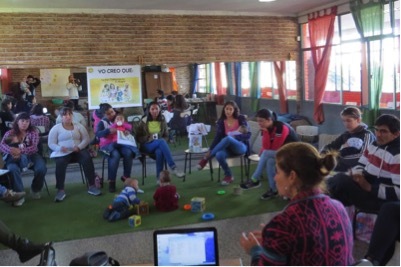 Young mothers and at-risk teenagers are receiving some long-awaited help with the assistance of two new programs implemented by Global Peace Women (GPW) Uruguay last August. Fifty women recovering from family and economic crisis are participating in the programs designed to provide knowledge and support for the young women to uplift their confidence as vital members of their present and future families. Mothers who lack the daily resources to educate and sustain their families attend bi-weekly meetings with their 0-4 year-old children and partners where they have the opportunity to socialize with other young families and listen to guest speakers and experts. GPW representative Lic. Maria Rosa Ceballos provided a workshop for 25 young women on “attachment during the first months of life.” Parents were able to share and discuss their challenges and successes and explored the importance of an extended family model that strengthened intergenerational support for children and their families. 25 foster home teenagers who have been separated from their families due to difficult situations like negligence and abuse are part of what they call their “new family” in another program by GPW Uruguay. Using the motto, “Peace Begins in the Home,” these young women are enthusiastic to participate in an ongoing campaign spreading awareness of the importance of healthy families in creating healthy societies and a world of peace.